The Office of Website Management. Well, you're in our office right now. Everything in your current window, the menus to the left and at the bottom of this page, this whole Sussex County website is managed from here. There are over a thousand of pages of content describing the function of Sussex County government, providing informative news articles, and hopefully making it easier for citizens and Sussex County employees to find what they are looking for. Go ahead, try the search box at the top of this page. This Office also manages the Sussex County Email Newsletter. If you haven't subscribed yet, what are you waiting for? It's a great way to stay up to date on happenings in Sussex County government. We want your feedback! What works, what doesn't, and what enhancements would you like to see? We may not be able to respond to change requests immediately, but all suggestions will be given serious consideration. We're on Social Media too. One of our goals is to provide what you are actually looking for, not what we think you want. 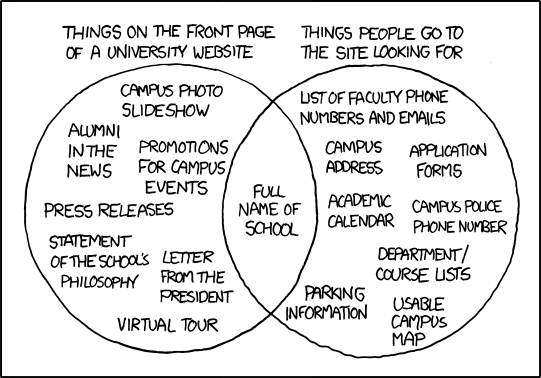 This cartoon illustrates the point, used with permission from xkcd.com . 11/14/2011 - Curly quotes often break RSS feeds, particularly if the curly quote is in the article title or introductory blurb. What's a curly quote? Microsoft Word does these by default. You can turn them off, or you can convert the curly quotes to straight quotes for use on the web. Uncheck "Straight quotes" with "smart quotes"
This macro helps you "fix" a document that contains curly quotes. I configured it as a button on my Word toolbar for one click use. 11/05/2010 - Tips for formatting pictures in Microsoft Office documents. Get them here. 10/20/2010 - A note about Internet Explorer. We know many of you are using Internet Explorer to read this page. Until today, we've tried to test our pages in as many different web browsers as we could, but time waits for no browser. Internet Explorer version 6, otherwise known as IE6, is no longer supported by major websites and we must move on as well. We'll continue to use Internet Explorer, and we'll try to keep it backward compatible with older versions, but from this date forward our pages will be tested for version 8 (IE8) and up. You probably won't mind, because very few of you are still using IE6. If you haven't upgraded yet, what are you waiting for? Get it here.